You might not know but there are so many beautiful places to visit in Ohio. While the Buckeye State probably isn’t at the top of your destinations to visit in the U.S., it should be. 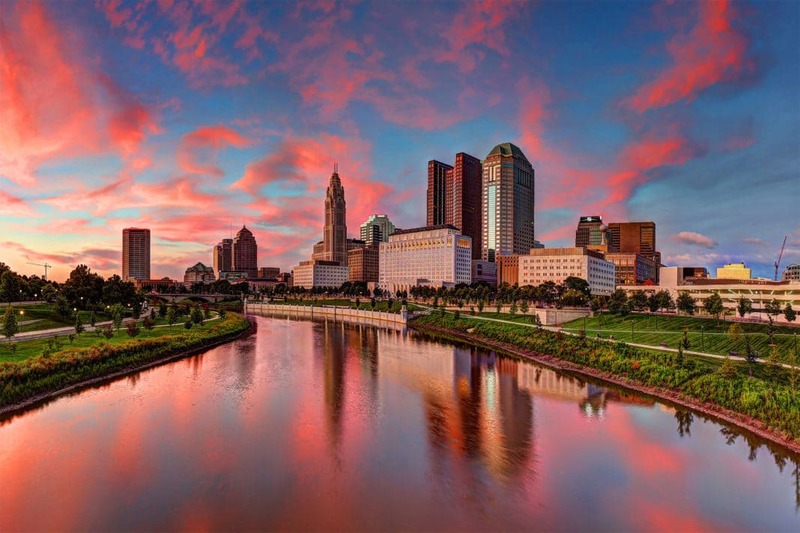 From quaint towns to stunning natural landscapes and vibrant cities, there are so many places to visit in Ohio for the adventurous traveler. Without further ado, we have compiled a list of some of our favorite places in the state. Here they are in no particular order. This lovely mid-western state stretches all the way from tr Ohio River to the Appalachian Mountains and Lake Erie. Along the shores of the lake, you'll find the city of Cleveland, Cleveland Museum of Art, and its famous collection of both European and Asian works. Cleveland is also home to the Rock and Roll Hall of Fame and close to the expansive Cuyahoga Valley National Park. It just goes to show that even when you're in the city, you're still not too far from nature. Wherever you want to go, just know that it's not spread too far apart. What are some of the places you've been wanting to go to? Keep them in mind as you read along and hold onto your hats. Things are about to get interesting. No, this isn’t a scene plucked from the first Lord of the Rings. Believe it or not, this is one of the most underrated places to visit in Ohio. 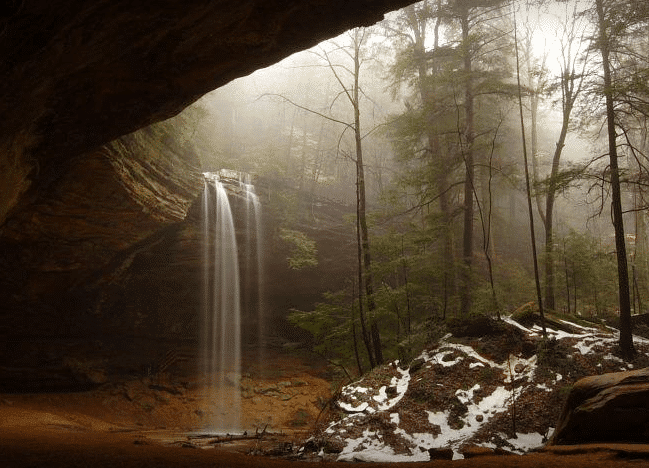 Tucked away in Hocking Hills State Park, you will find these epic falls. Here’s the best part. Since they’re virtually unknown in the world of tourists, you won’t have to worry about sharing the trail. But we’ve got to give you a heads up. They are pretty difficult to find. You’re going to start off driving down 6 miles past the city of Logan on Route 664. Turn off onto Zwinkle Road. Then, you’ll come across a trail behind the guardrail. Follow the trail down the river gorge and it will take you right to the falls. The east side of the river is technically private property, so make sure you stay on the public side. Make sure you bring your swimsuit and a good waterproof camera. Isn't this beautiful? We swear it looks like a scene plucked straight from a Wes Anderson film. 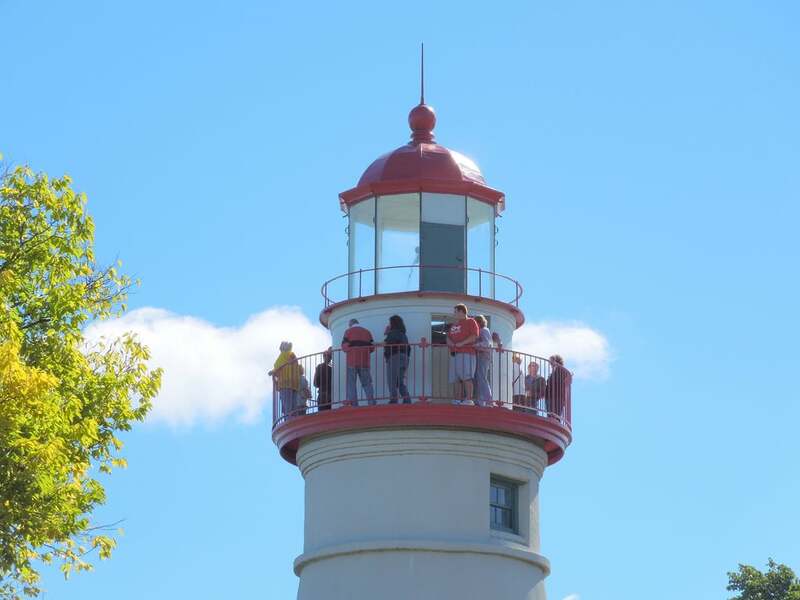 While you’re visiting places in Ohio, you just can’t miss out on seeing the Marblehead Lighthouse State Park. As one of Lake Erie's oldest and most photographed landmarks, it certainly is a sight to behold. 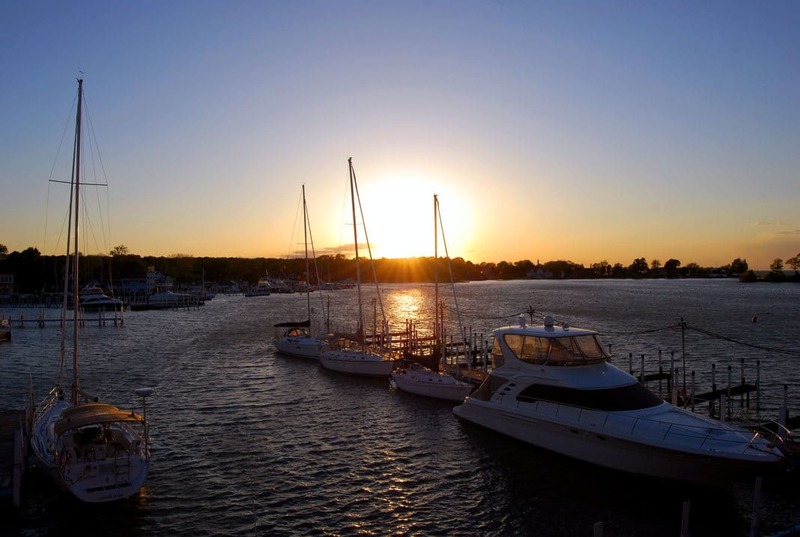 The grounds surrounding the park offer the perfect places to have a picnic with views of not only Lake Erie but also Sandusky Bay, Kelleys Island, and South Bass Island. The Marblehead Lighthouse holds a great deal of history on its grounds. Ever since 1822, it has been guiding sailors along the rocky shores of the land, providing a safe passageway for ships of the night. Throughout history, there have been fifteen lighthouse keepers (two of them women) who attended to the beacon. The first ever keeper of the lighthouse was Benajah Wolcott, a Revolutionary War veteran. Along with his family, Wolcott lived on the Sandusky side of the Peninsula. Each night, he would go and light the original thirteen whale lamps on the fixture. Other duties of the lighthouse keeper included keeping note of the weather conditions, logging passing ships in a journal, and organizing rescue efforts. When Benajah passed away, his wife Rachael took over his duties. Today, the Ohio Department of Natural Resources has maintained the property, proudly accepting ownership of it May of 1988. Live out your childish fantasties in the coolest treehouses for adults. Some things never change and we're happy to say that our childlike sense of wonder is one of them. Play Tarzan here. 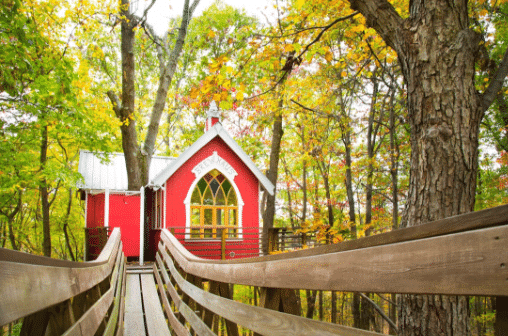 Smack between the sprawling cities of Columbus and Cincinnati, you will find an amazing hidden treehouse destination. Built by Pete Nelson from the popular tv show “Treehouse Masters,” these cabins and treehouses offer a luxurious space to stay among nature. Choose from six different homes, each featuring spiral staircases, suspension bridges, lovely decks with a sweeping view of your surroundings, and beautiful interiors. Each one is a masterpiece in its own right, varying in design. One of our favorites is the Nest, an octagonal space complete with cathedral-style windows and an old 1800s pine decor. Each of the rooms is fully heated with kitchens and bathrooms, so you can enjoy a comfortable, homey stay. When you’re looking for things to do nearby, check out the Mohican State Park. If you’re in the mood for a little bit of adventure, check out the Tree Frog Canopy Tours. Here, you’ll find a series of activities to enjoy, including zip lines, sky bridges, and rappelling through the treetops. Of all the places to visit in Ohio, we can’t think of a better way to spend our time than high up in the treetops enjoying a bird’s eye view of nature. If you haven’t heard of or been to Cedar Point Amusement Park, you are seriously missing out in life. As the country’s second oldest amusement park, it holds so many special memories and is an integral part of the city’s history. Spanning an impressive 364 acres, it’s packed with fun from front to back. One of our favorite things to do there is to ride the rickety old 60s era roller coaster, Blue Streak. You can also enjoy an outdoor water park and mile-long white sand beach along the shores of Lake Erie. It only gets better from there. 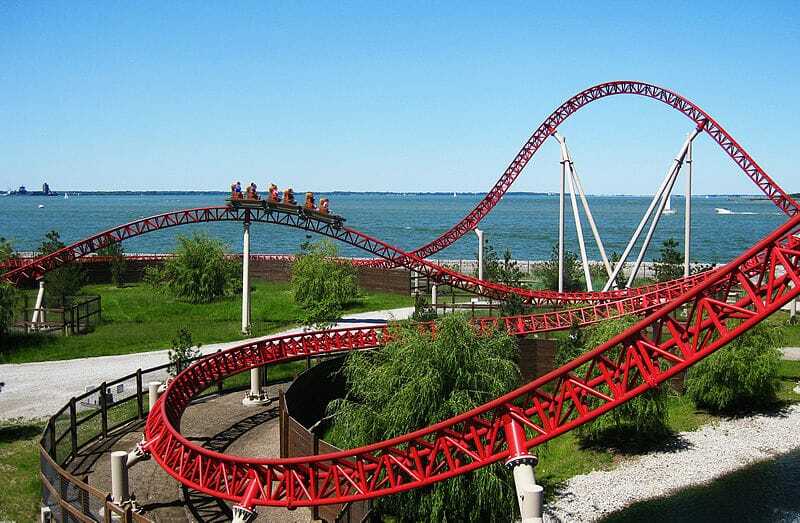 Cedar Point is the only amusement park in the world that has six roller coasters each over 200 feet high. As one of the best places to visit in Ohio, it makes a great weekend getaway stop. Whether you’re looking to bring the whole family or just traveling with friends, there are so many thrill rides to try out as well as some great nighttime entertainment. Wrap up a day of action with a relaxing stay at the beautiful waterfront hotel, Hotel Breakers. This beachfront dream offers passes to the park as well as fun “amusement-themed” decor throughout the site. During your stay, the hotel offers a myriad of fun activities and amenities for you to enjoy. Take a dip in the outdoor pool, indoor one, sit by the fire pit, play beach games, and more. Who knows? You might just end up turning this weekend getaway into an extended trip. 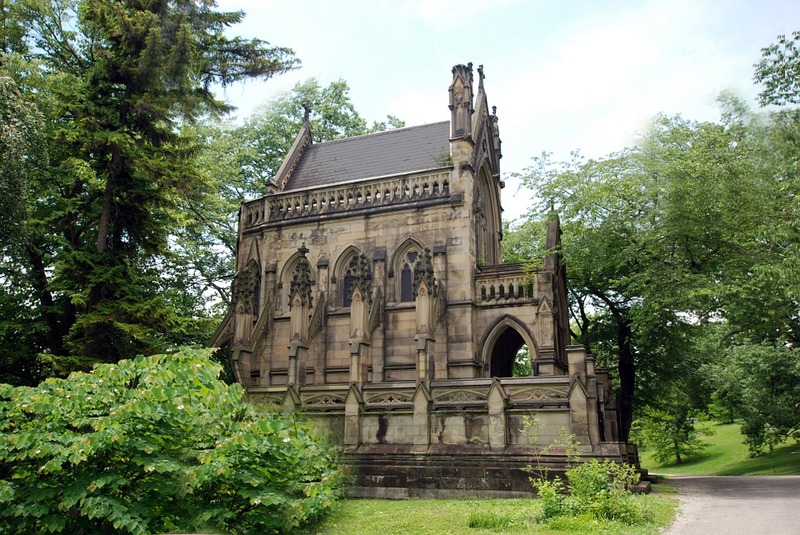 Located in the Spring Grove Cemetery, you will find the Dexter Mausoleum. Intended to resemble a Gothic Revival funeral monument, it is often mistaken for one of the land’s three chapels. Instead, it is a private family mausoleum for the English immigrant and whiskey baron. While it was designed in 1869, it remains one of the buildings with the only two symmetrical flying buttresses in Cincinnati. It is registered as a historical landmark. Hold onto your hats. We’ve found the Key West of Ohio. Over on Small Bass Island in Lake Erie, you’ll find the charming little village of Put-In-Bay. When it comes to the best places to visit in Ohio, we don’t know how this one managed to stay such a secret. With a great bar scene and beautiful natural surroundings, it’s one of the best places to go for a weekend getaway in the summer. Head on over to the Sand Bar for some pool volleyball. At night, locals go play a match on the white sand beach framed by tiki lights. To get here, you’re going to need to take a ferry over and then use golf carts to get around. There are plenty of things to see and do. If you’d rather pass up on the bar scene, you can also check out the lighthouse, Put-In-Bay Winery, and the Butterfly House. You can also rent out a kayak or canoe and paddle around the protected bay area. Last but certainly not least, there are also some great opportunities for shopping and dining should you prefer something more low key. Tucked away among the rolling green farmland and dense woods of Champaign County, you’ll find the magical King Crystal Caverns. You can trace their origins back thousands of years to when a once underground river cut through limestone. The force of the river carved out hollowed rooms and passageways filled with stalactites, stalagmites, and other magnificent structures. While they were once hidden, these caverns are now one of the most popular places to visit in Ohio. You can visit them pretty much any time of the year. Regardless of the temperature above the surface, the caverns remain a steady 54 degrees year-round. The humidity is always hovering above 90 percent, so it feels a lot warmer inside than it actually is. As the largest caverns in the state, there are over 2 miles of passageways ranging from 30 feet in depth to over 103 feet. Special tours allow you to explore the “historic” part of the cave opened and discovered just a few decades ago. 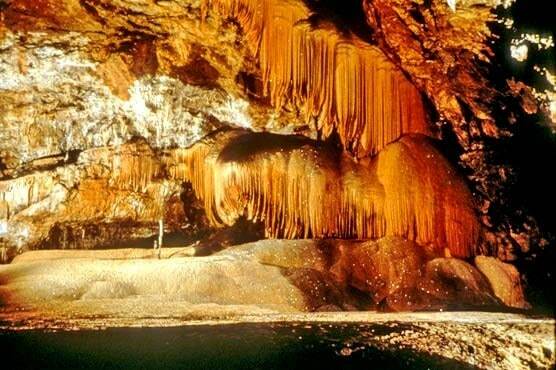 Long been described as the place “Where Nature Carved a Fairyland,” the exact age of the caverns is unknown. The Columbus Grey Limestone in the caverns is some 400 million years old and the oldest crystal inside is estimated to be at or around 250,000 years old. Of all the places to visit in Ohio, you have to go see the abandoned village, Shawnee. While traveling through the back roads of the country, it’s one of the most interesting places we ever stumbled upon. But this isn’t just your ordinary ghost town. Protruding balconies hang over run down store fronts. Shawnee likes like a scene plucked straight out of the 19th century. Some buildings are boarded up. If you squint past the dust in others, you’ll see piles of antiques and dusty signs left on the floor. 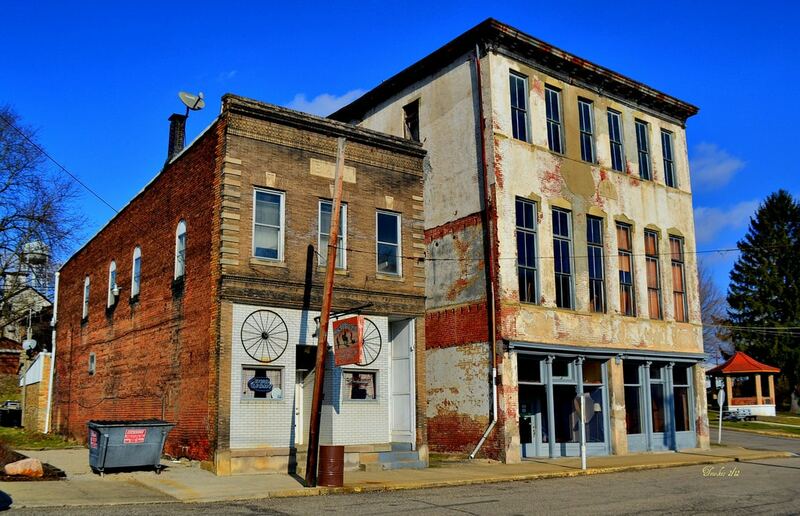 While the phrase “ghost town” often invokes images of old cowboy towns and tumbleweeds blowing across the ground, Shawnee still has a little bit of life left in it. No, we’re not just talking about that spider hanging from the cobweb on the ceiling. According to a census taken back in 2010, the town had 665 residents - a significant decline from its population of 4,000 during the 1960s. Walk along the streets and you’ll swear you’ve never stepped foot in a town so quiet. A few cars are parked along Main Street. Here, a furniture store, bar, and an old antique shop are still in operation. At night, the weak street lights flicker and fade, casting a subtle glow on the old buildings until the sun comes up. 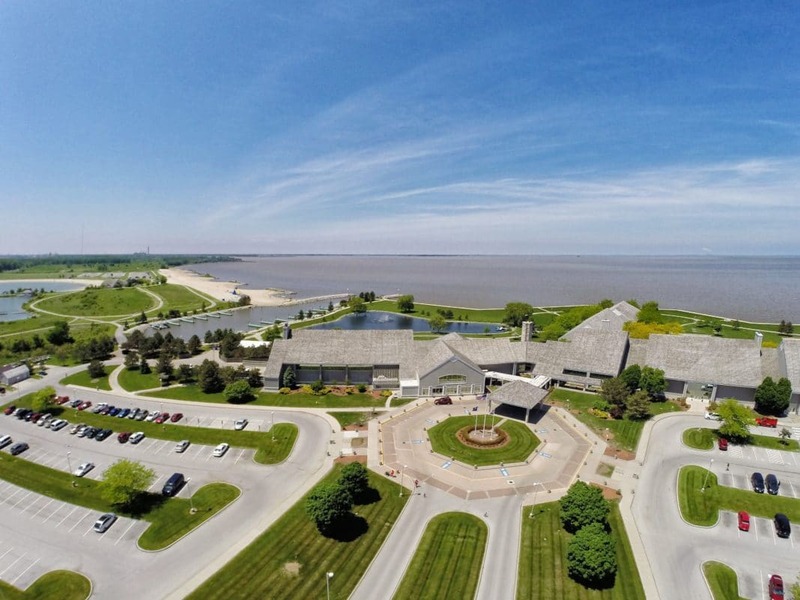 If you’re looking to get outside and connect with the great outdoors, Maumee Bay State Park is one of the best places to visit in Ohio. Offering over 1,300 acres of sprawling land, there is plenty of beauty to go around. Take a walk along the boardwalk trails of Lake Erie, winding through tall reeds in the marshlands and through dense woods. Ride your bike along the paved trails or swim offshore from the lovely sand beaches. Maumee State Bay Park offers both the scenic Lake Erie and a second large inland lake for non-motorized watercraft. Go fishing, swimming, or just lie out and soak up the sun. In addition, you will also find an 18-hole golf course and pro shop. When it comes to accommodations, you have plenty of options to choose from. Choose a campsite that offers access to all the park’s amenities. Stay in a deluxe cabin with multiple bedrooms and a complete kitchen. Or you could opt for a yurt. This is a great getaway for friends and families alike. There are also plenty of private, romantic accommodations for couples seeking a getaway. Often referred to as the Mansfield Reformatory, this historic prison is a major tourist draw among the places to visit in Ohio. Built between 1886 to 1910, it remained open until 1990 when a U.S. Federal Court ordered the facility to be shut down. This facility was used multiple times during its history but is perhaps most famous for its appearance in the iconic film Shawshank Redemption when it was used for the majority of the movie. 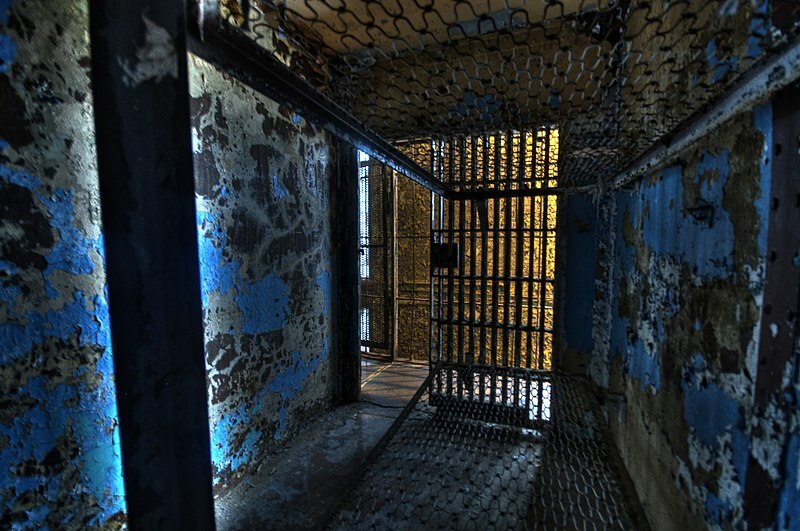 While the structure is certainly run down, the Mansfield Reformatory Preservation Society is working to restore it to its original state. The roofing has been replaced, the warden’s quarters restored, and there has also been a complete restoration of the central guard room between the East and West Cell blocks. Lose yourself in 32 rooms of wonder in Columbus’ Book Loft. This place is truly a bibliophile’s paradise. 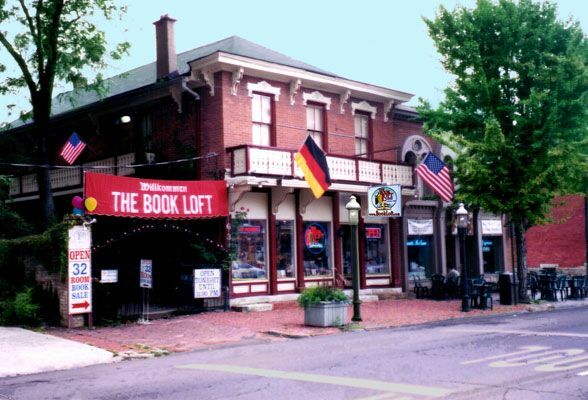 Over forty years ago, the Book Loft opened its doors to the German Village. Today, this maze of literature sells everything from children’s stories to bargain books, manga, history, horror, and classic literature. You’ll find it located downtown in the south end of the city, listed on the National Register of Historic Places. In the first half of the 1800s, the neighborhood was settled by a wave of German immigrants. While it was considered one of the city’s worst slums in the mid-20th century, today it’s one of the most sought after zip codes in the state. 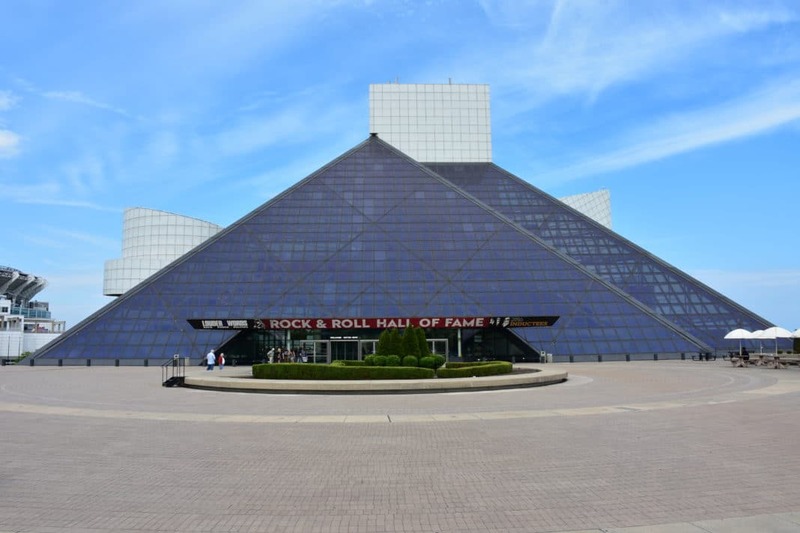 While you’re scoping out the best places to visit in Ohio, why not go to the Rock and Roll Hall of Fame? Located on the shores of Lake Erie, you’ll find it right in the heart of downtown Cleveland. This hall memorializes the greats and other notable figures who have contributed a lot to the world of rock and roll. Back in 1983, the Rock and Roll Hall of Fame Foundation was created by the Atlantic Records founder and Chairman Ahmet Ertegun. In 1986, Cleveland was chosen to be the Hall’s permanent home. We hope you enjoyed reading through our list of the best places to visit in Ohio. The often-overlooked Buckeye State has so much in the way of natural beauty, entertainment, and hidden gems. For the adventurous traveler, this state offers so much to explore. On our list, we have included picks from the most popular tourist attractions to off the grid wonders that you just can't miss. Which of the places on our list would you like to visit the most? Let us know in the comment section below.